The Royal Family cost the taxpayer £33.3m last year. Branding experts say they brought in more than £20bn. How you regard those figures and which you choose to highlight will depend on your view of the monarchy, a subject on which few of us are ambivalent. 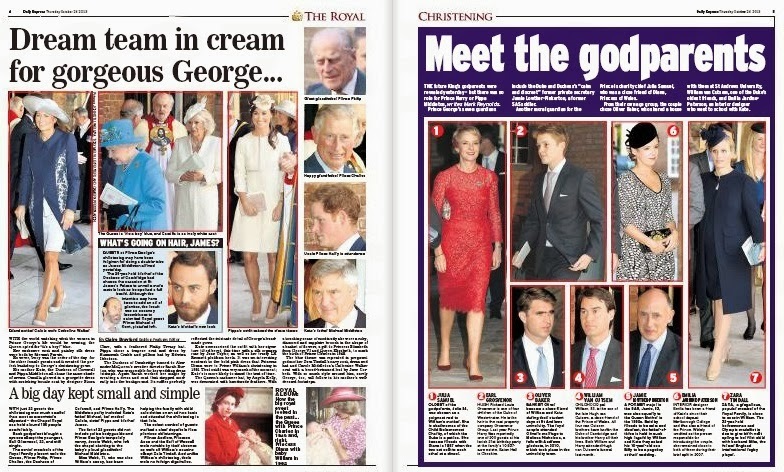 And so it was this morning with newspaper coverage of the christening of Prince George. The Independent nailed its republican colours to the masthead by recording the occasion as the bottom nib on its last home news page. In so doing, it raised a few laughs and got a lot of free publicity. So in spite of themselves, even sceptics benefit from the Royal Family. 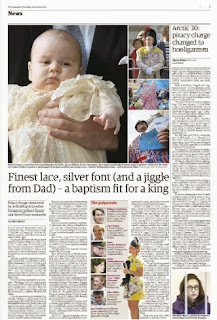 The Daily Mail went to the other extreme with a 15-page souvenir extravaganza that actually ran to 16 if you counted Bel Mooney's oped on how everyone loves a christening. 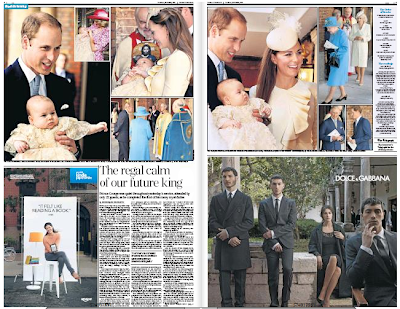 The Telegraph dropped the puff - something papers generally do only in the presence of monumental stories such as 9/11 or the death of a Prime Minister - so it could run a full-page picture of the sainted Catherine and her sprog. It was not sufficiently committed, however, to forgo the revenue afforded by the 10x7 ad at the foot of the page. Who was right? republican or royalist, I'd say that all three were all wrong. They all misjudged the occasion and were all too tricksy for their own good. For a start, this was a private event. There were only 22 guests at the Chapel Royal and there was no room for outsiders such as newspaper reporters or photographers. Neither the folk on the pavement in their Union Flag suits nor the true blue Press grasped this. The Mail had cleared buckets of space, but there was little to report and few people to see, so it had to resort to twin full-page pictures on 2 and 3 of the Duke and Duchess holding their baby - the full OK Hello monty. 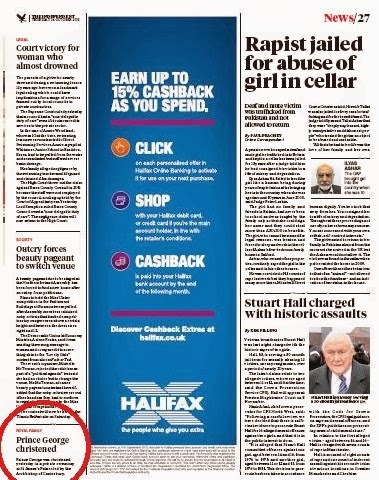 It struggled to keep this going all the way to the comment section, which meant that the first news story - the Merkel phone-tapping claims - did not appear until page 21. 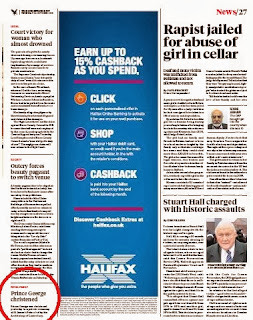 Journalists at the Telegraph, whose coverage ran straight through to page 5 before starting real news with Cameron and the green tax on 6, must have envied the Mail its acres of newsprint. The accountants will have been delighted, however, that every news page was jam-packed with ads. 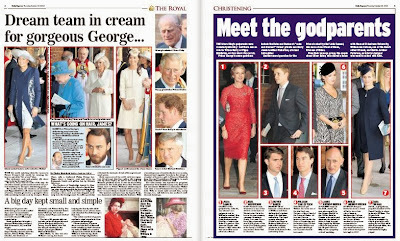 Were those guys in suits at the bottom of page 3 christening guests or blokes trying to sell designer clothing? Nothing could breathe. The picture choice was poor, the prose uninspired. 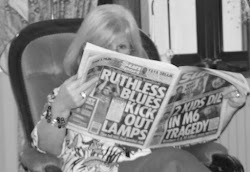 The paper had sent the chief reporter Gordon Rayner. The chief reporter, for heaven's sake? Chief reporters are in the business of covering - and, even better, uncovering - hard news stories; the ones that are difficult to pin down, the ones where the leading players don't want to be questioned about their darkest secrets. The leading players yesterday didn't want to be questioned about their darkest secrets, nor even about their lightest moments - and this wasn't the day to ask them. Every piece of information published this morning, apart from the chats with the faithful on the street, will have been available in some handout or press release. In essence there was nothing to say. And when there is nothing to say, papers need to bring out their finest voices (often to be found in the features or sports departments) to say nothing in 1,500 words of panache, elegance and wit. All of that could satisfactorily be packed into a 500-word story with a picture - as the Guardian proved with its page 3. But this was the christening of 'our future king' and statements needed to be made, not in words, but in space. Please do not refer to Lady Diana Spencer as the future Queen of England. In those days memos came in paper form and were pinned to notice boards in between the holiday homes for rent and announcements from on high about the chessboard shuffling of specialists. It remained, yellowed and curling, on the one near the loos and the sandwich machines until the paper did its moonlight flit to Wapping five years later. It was a wise instruction. Diana was not destined to become our Queen. Prince George may be fourth in line to the throne, but it is not a given that he will get there. 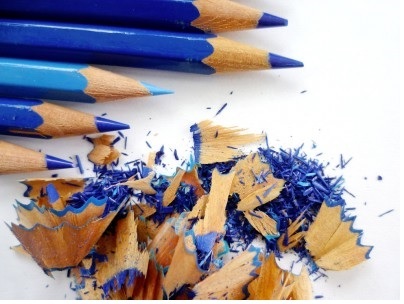 Most of us would not wish him, his father or even his grandfather ill, but life has a habit of not conforming to plan. 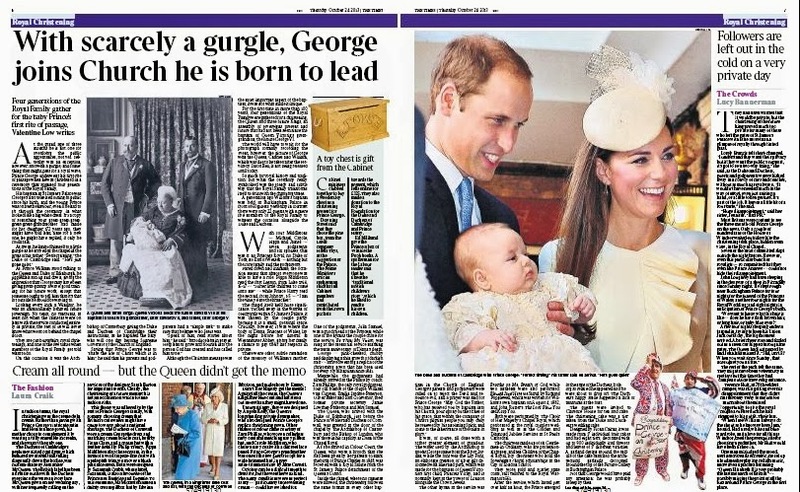 When George's great-grandmother was christened, nobody expected her to become Queen. When her father was christened, nobody thought he would become King. English history is paved with stories of accidental monarchs. It's asking a lot to believe that by the turn of the next century the succession will have moved smoothly from Elizabeth II via Charles and William to George VII. Yet almost every paper stuck with the fairytale. They also found it difficult to avoid the mush trap. There were lots of Gorgeous Georges - but isn't he the MP for Bradford West? And there were lots of pictures of a baby with three hands, one of which was ten times the size of the other two. This alien child featured on the front of the Times, Sun, Mail and Express and inside the Guardian. 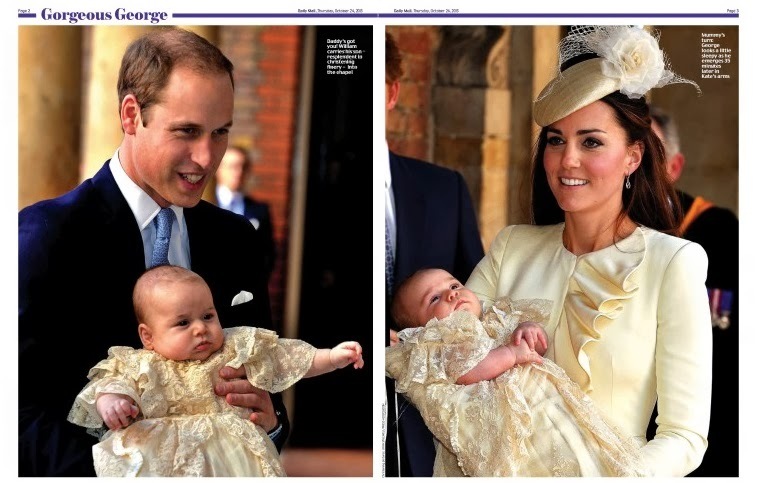 The Telegraph and Mirror wisely chose a picture of mother and baby - while the Times kept a foot in both camps by using Kate on one of its stylish wraparounds. 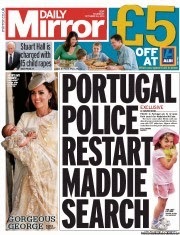 Since the success of the Olympic innovation, the paper has produced wraparounds at the drop of a hat. On days such as today it's quite a good move: it preserves the sanctity of the 'real' news front while looking attractive enough on the newsstands to pick up a few extra casual sales. The other papers that opted for the three-handed boy in a dress presumably did so on the premise that readerswould want to see the clearest picture possible of the young prince. Looking at other people's baby pictures is a duty of friendship. Looking at this baby's picture in the hope of finding some likeness to Diana, Victoria or Genghis Khan goes beyond duty and into the realms of masochism. He's a fine enough chap, but the photograph tells me nothing other than that he's a three-month old baby. We can hope for something more meaningful tomorrow morning when we see the official portrait of the Queen and her three direct descendants. 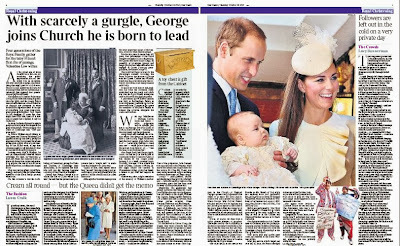 Friday update: the Sun and the Telegraph got the point of the four generations photograph, the Times, Mail, Express and Mirror all kept the oldsters out and ran with Wills, Kate and George. 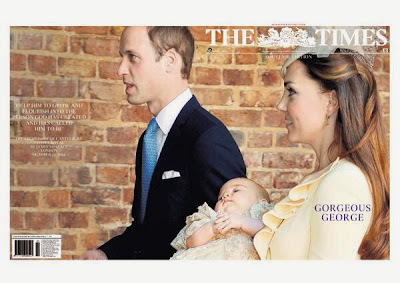 An odd choice - and goodness knows why the Times thought its readers needed two duchesses on its front. And what about the words? The Guardian's Caroline Davies did a neat job and sustained her theme of first, second, third and finally fourth estate nicely. Thankfully, the space ran out before Benedict Cumberbatch could put in an appearance. The tabs were much of a muchness, with a couple of spreads each, apart from the i, which restricted itself to a picture and extended caption - probably not enough for a readership that includes a lot of young and elderly readers who buy it because of the price. Many in these groups are quite avid royalists. The Times, with a class team of Valentine Low, Lucy Bannerman and Patrick Kidd, was way out ahead of the field in the text stakes - although the fashion editor Laura Craik stumbled in saying that the christening robe was designed by Angela Kelly. It was a replica of one that had been used for generations, so there wasn't much designing to be done.The paper also got the balance right with a front-page picture, a proper news splash and four ad-constrained pages from 6-10. The headline-writing was sharp. There were surprises, too, with the Express outperforming the Mail on almost every measure and the Mirror giving the event more space and with more style than the royalist Sun. The Star, which returned to the killer spiders for its splash, meanwhile came up with a puff that would stop any casual reader in their tracks. 'Jordan wets the baby's head'. As the asterisk pointed out, the Jordan in question was the river rather than the model. Dear GOG, after many years of patiently and beautifully turning my prose into English, you will doubtless understand my surprise that I was NOT asked by anyone on The Times to provide copy on the media/public reaction in China to the christening. I ascribe this to either 1) progress 2) my phone was switched off.